Signing a free agent to a minor league contract usually generates far more enthusiasm for a fan base than what is appropriately deserved. Players generally have far greater name recognition than what their current talent levels should suggest. A player generally signs a minor league contract because it's the best available offer and that alone should be an indication of the player's current status. They're generally either old, injured, overhyped, or some combination thereof which would lead a team to take a chance on them without offering them any guarantee at the active roster. Occasionally it works out well. Aging stars Eric Chavez and Freddy Garcia proved to be extremely valuable to the 2011 Yankees. More often than not though, there's no good news between the day the player signs and the day he's released as potential Hall of Famers Manny Ramirez and Vladimir Guerrero could attest to last season. But I'm here to feed into the hype machine, so I present my five most intriguing teams this preseason for minor league contracts. Most of the players I mention now will probably never be mentioned again this season, but there's enough potential there to make a storyline worth following. When your last winning season came when Barry Bonds was still wearing a size 7.5 hat, you have to take some chances on hoping a few players down on their luck can turn it around. In 2010 Jonathan Sanchez, coming off a World Series win, pitched 193.1 IP to a 3.07 ERA. How long ago that now seems. His stock has fallen to being traded for Melky Cabrera, to being designated for assignment by the Royals. Sanchez was a player who always had trouble with walks, but he struck out enough guys to stick around the majors. That turned around last year when his K rate dropped to 6.3 K/9 and his walk rate skyrocketed to 7.4 BB/9. The move back to the NL may help but he's going to need to show he can regain his control to make the team. Jose Contreras is a former All-Star, World Series Champion, and Olympic Gold Medalist. Now he's 41 years old and has pitched 27.2 innings the last two seasons while spending most of the time on the disabled list. I'm sure the Pirates are only looking at Contreras for potential mop-up duty, but I feel like at this point it would be more dignified for everyone if Contreras called it a career. He's a Cuban defector who has earned over $67M successfully pitching in the majors. There's nothing left to prove. Gerrit Cole should be excited if these are the two guys he's going to have to beat out. I thought Brandon Inge would be offered a major league contract from someone, but it looks like most teams are looking for a little more pop from their third baseman. The Pirates should have Alvarez permanently stationed at third, so Inge would figure to be no more than a utility man if he makes the team. He's never been a good contact player, batting a career .234, however neither has Alvarez. If he can make the team, Alvarez doesn't improve, and the Pirates are at all in contention, Inge's name my start to be heard a lot more. After dumping almost their entire major league roster in the offseason, Marlins fans better hope there is something to look forward to in spring training. What they're looking at is a bunch of old castoffs from other teams, but at least there are a lot of them. Chone Figgins has been the laughing stock of baseball since he joined the Mariners in 2010. It's so bad that the Mariners are paying Figgins $8M this season not to play with them. So while the rest of baseball is looking at a guy who batted .227/.302/.283 in three seasons in Seattle, Miami can dream of the guy who hit .291/.363/.388 with the Angels. Unfortunately for Marlins fans, a lot of Figgins' value came from his speed (7 straight seasons with 30+ SB), at the age of 35 his fastest days are likely behind him. I don't know what to think about Casey Kotchman. He clearly doesn't have the bat to play first base and at this point in his career he isn't likely to develop power. I just don't see how any team with hope of contending (which I guess does exclude the Marlins) could possibly roster him. It's the opposite with Austin Kearns. He offers power but little else and unlike Kotchman is a minus defender. Maybe the Marlins can combine the two players to produce one serviceable one. Kevin Slowey is young, but there's little evidence to suggest he's any good. He has a hard time striking batters out and he just spent 2012 on the disabled list. He was a prior second round draft pick, so there may still be hope for him to develop, but it doesn't look good right now. Chad Qualls on the other hand is 34, has a 5.24 ERA over the last 3 seasons with 6 teams, but somehow people keep seeing enough to warrant giving him 185.2 IP over that time. All I see is a pitcher in decline, but with the way the Marlins are going, anyone could make the active roster, especially if they want to delay some service time. It would seem unnatural to make a list like this without including the Rays. Where better to find overlooked talent than players looking for minor league contracts? Take for example a reliever who between 2009-2011 averaged 31 saves with 8.5 K/9. Closers like that usually have options on the open market. However those options become limited when you're forced to take a year off of baseball to return to the Dominican Republic to sort out legal issues. I think everyone in baseball will be looking to see if Juan Carlos Oviedo, formerly Leo Nunez, will be able to bounce back and have a successful season. The Rays have stocked up on a couple bats that have shown amazing power, but not much else. Shelly Duncan has shown the ability to put the ball in no man's land but his .203 average last year makes it difficult to give him an every day lineup spot. Similarly Jack Cust can crush the ball, but after leading the league in strikeouts for three straight seasons he's been released by the Phillies, Astros, Yankees, and Jays without seeing major league playing time. Cust has at least shown he can take a walk, but both of these guys need to show they can do more with the bat then belt the occasional one out of the park if they want to see regular time. My intrigue in the Baltimore Orioles focuses on a few pitchers who have been out of baseball for at least a year. Mark Hendrickson is 38 and last pitched for the Orioles in 2011 to a 5.73 ERA in 8 outings from the bullpen. Hendrickson is a former two sport professional athlete (played for the 76ers, Nets, Cavaliers, Kings) who was drafted six times before finally signing with the Blue Jays. He's a soft thrower who seems to prove the adage that if you're left handed and alive you can stick around in the game. As interesting as his career path is though I have a hard time seeing him stick around, especially for a team that wants to get back to the playoffs. Joel Pineiro and Manny Delcarmen haven't pitched in the majors since 2011 and 2010 respectively but seem to offer slightly more realistic approaches, partially just because neither has hit the age of 35 yet. No one will ever mix these righties up with Roy Halladay but they've seen varied level of success at the major league level and could be assets to eat up some innings. Jair Jurrjens is the most interesting case on the team. His original $1.5M with the Orioles seemed more than reasonable but a red flag in his medical history forced them to go for a minor league deal. He's only 27 and in 2011 he had a first half ERA of 1.87, won 12 games, and had major support to start the All-Star game. He seemed to be doing it with smoke and mirrors though, only able to strike out 5.3 per 9 innings and his second half saw him crash down to earth with a 5.88 ERA. His 2012 wasn't any better, lasting only 48.1 IP in the majors while spending time in AAA. Jurrjens is never going to be a high power pitcher but he has shown enough control in the past to be effective. It will be interesting to see if he can make it back to being a successful starter. The Indians have by far the most interesting collection of players on minor league contracts. Combined they have 8 All-Star appearances and an MVP. Jason Giambi hasn't been heard from in a few years, serving as a backup 1B in Colorado, but he'll be an interesting DH option on a team looking for some power. There were doubts as to whether he'd even play this season, after interviewing for the managerial job for the Rockies, but if Francona is looking for any sort of veteran presence Giambi will be at the top of the list. 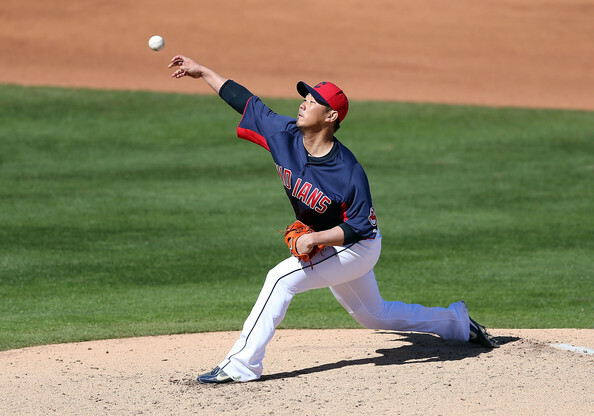 The Indians have two of the most interesting recovery pitching projects in camp in Scott Kazmir and Daisuke Matsuzaka. Both pitchers have had major walk issues and have been absolutely terrible the last few seasons. In the last two years Dice-K has thrown only 83 IP to a 6.94 ERA while Kazmir has only thrown 1.2 IP in the same period in the MLB having been released by the Angels and pitching for the Sugar Land Skeeters of the Atlantic League and the Gigantes de Carolina of the Puerto Rican Professional Baseball League to pass the time. Both pitchers have 200+ IP seasons on their resume though and were thought to be future staff aces. If Dice-K can start attacking batters again and Kazmir's fastball holds up they might be able to capture some of their former glory. Rounding out the Indians camp are Matt Capps, Ben Francisco, Ryan Raburn, and Jeremy Hermida. Capps has had some injuries in recent seasons, but he still has a 3.38 ERA over the last three years and had a 42 save season in 2010. Francisco, Raburn, and Hermida will compete for outfield depth on the club. The outfield got a lot more crowded when Michael Bourn signed, but with a potential Stubbs platoon looming there may be an opportunity for one of these guys to break through.